The Surface Pro 4 has the option of three GPUs depending on which model you choose to go with. The base model is the Core m3-6Y30, which has the Intel HD 515 graphics with 24 execution units and a maximum frequency of 850 Mhz. The Core i5-6300U, which is the processor in the review sample, steps up to Intel HD 520 graphics, which has the same 24 execution units but with a maximum frequency of 1 GHz and more overall headroom for reduced throttling. Finally, if you select the top Core i7-6650U there is a bit of an upgrade, with this processor sporting the Intel Iris 540 graphics which is the GT3e model. This is somewhat special because it includes 64 MB of eDRAM as well as doubling the execution units from 24 to 48. The GT3e model has a maximum frequency of 1.05 GHz. 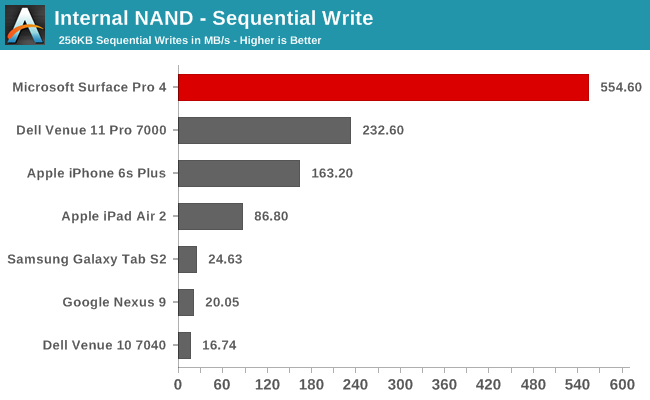 The Surface Pro 3 could also be had with Iris graphics, but architectural differences aside, there was no eDRAM and it had eight less execution units on the i7 model. All three are going to perform somewhat differently, although it would be pretty interesting to see what kind of a difference GT3e would make at this sort of TDP level. For today though, we have to test what we have, and that’s the GT2 i5-6300U. 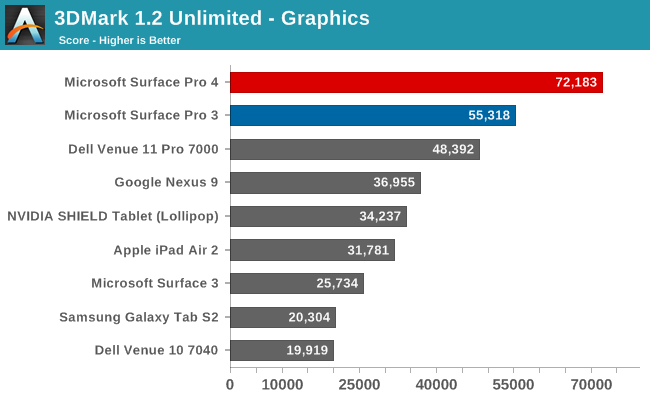 Once again, we’ll start with some Tablet comparisons. Futuremark’s 3DMark is available on all platforms, although when throwing Windows into the mix we always have to take a bit more caution as the level of rendering precision is not always equal. 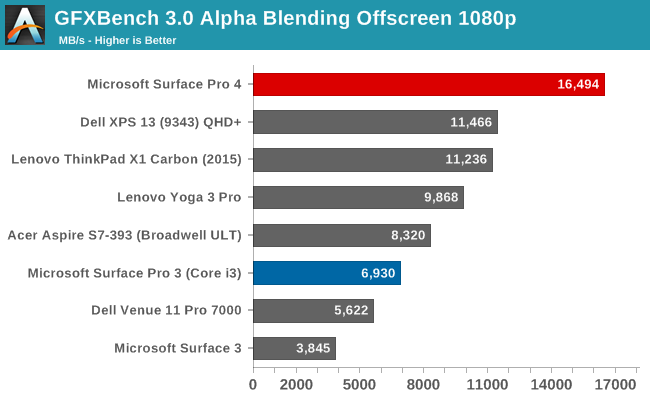 This is due to the fact that lower precision rendering modes - widely available and regularly used on Android and iOS to boost performance and save on power consumption - are not commonly available on Windows PCs, which forces them to use high (full) precision rendering most of the time. 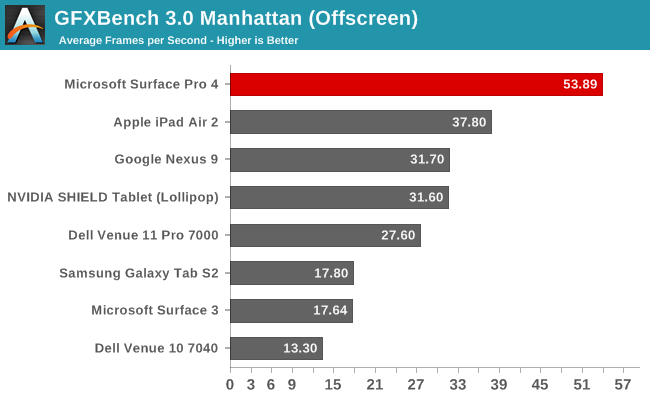 In any case the Core i5-6300U runs away with this test, easily outperforming the other tablets. The difference in performance between the Surface Pro 3 and Surface Pro 4 is an impressive 27% gain. 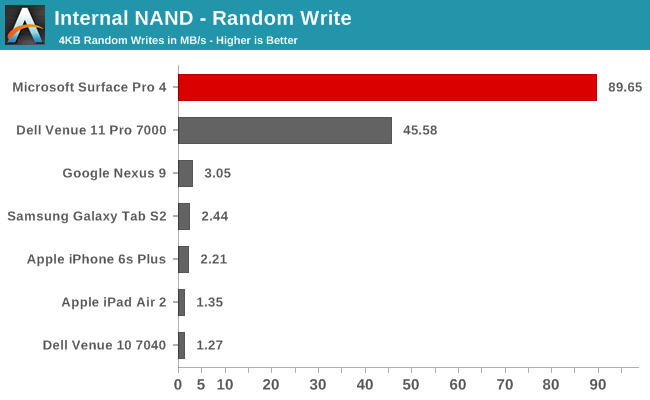 Most tablets are closer to 5-10 Watts of TDP for the SoC rather than 15 of Skylake-U, but I have to admit I’m curious to see how close the iPad Pro can come to this when it comes out. The Physics test in particular has been a strong point of Core powered devices. On the tablet comparisons, I’ve installed the OpenGL version of GFXBench. 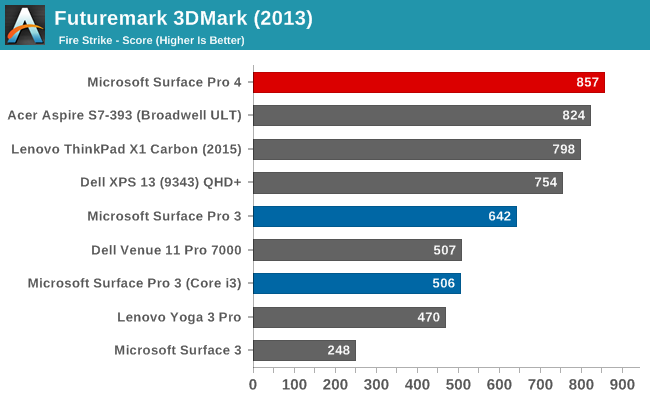 Once again the Surface Pro 4 outperforms everything, although in this test the margin is not quite as high. 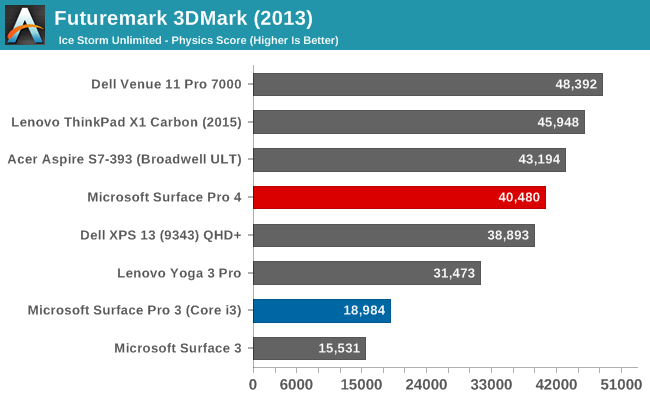 As with 3DMark, on Windows PCs, GFXBench runs at high precision only due to limitations in OpenGL versus OpenGL ES. 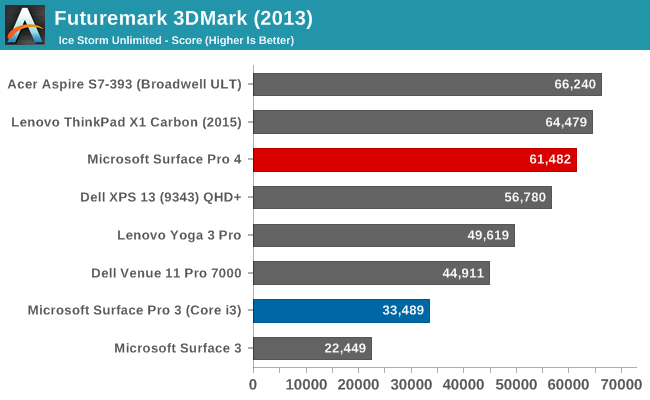 Compared to notebooks, this will really be a showcase of the performance differences from Broadwell and Haswell to Skylake with the latest Gen 9 graphics. Intel has dedicated more and more die space to graphics as time goes on, leading to significant GPU performance increases with every generation. On Windows, the 3DMark suite is much more comprehensive and features a lot more tests. Fire Strike is really for higher end systems, but it’s interesting to see how iGPUs are doing there. Sky Diver was added as a DX11 benchmark for gaming laptops and mid-range desktops and is less intensive. Cloud Gate limits to DX10 feature levels and is a good test for integrated graphics on a notebook, and then Ice Storm Unlimited is the cross platform one that we use to compare against other tablets. 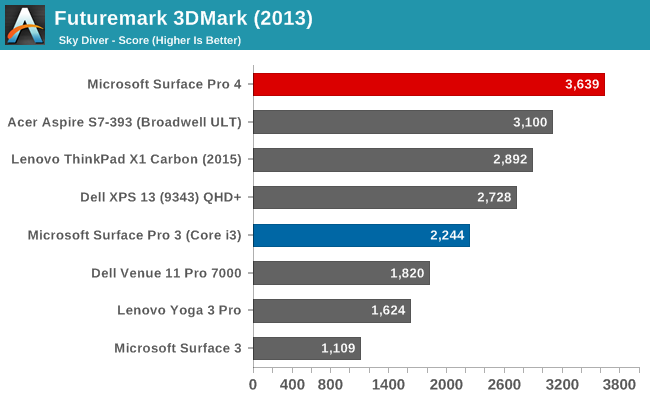 We also run 3DMark 11 which is older but gives us a good comparison over a longer time frame. 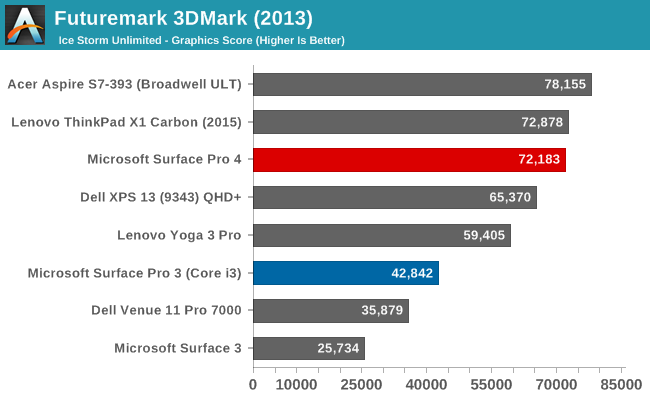 Overall there is quite a gain from the Broadwell Gen 8 graphics, but it really is dependent on the workload. The lighter tests actually see less of a gain. On the more complex workloads though, we can see over 30% increases from Broadwell on tests like Sky Diver and 3DMark 11. 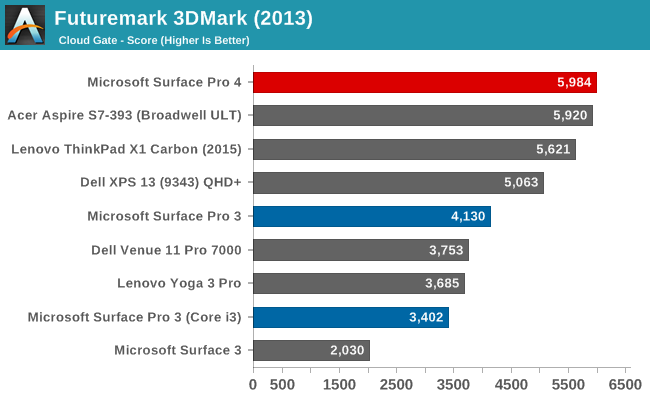 Even more impressive, if you compare Haswell’s Gen 7.5 graphics from the Surface Pro 3, there is a 33.5% increase in Fire Strike, a 44.9% increase in Cloud Gate, and a whopping 86.1% increase on 3DMark 11. 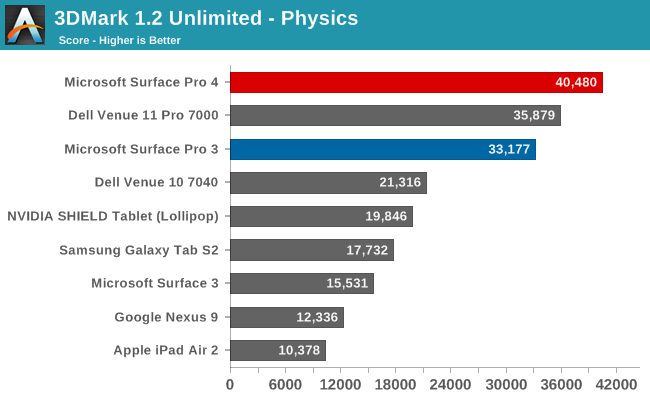 Unfortunately, the Surface Pro 3 was not run against Sky Diver and Ice Storm Unlimited, but regardless the performance increase generationally on the Surface Pro is very impressive. 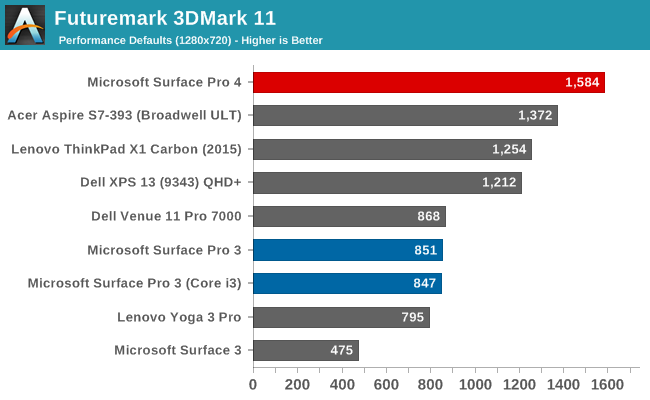 Some of that is the new Gen 9 graphics of course, but given how frequent thermal throttling was on the Surface Pro 3 when running GPU workloads, the thermal performance of Surface Pro 4 almost certainly had a hand in the higher 3DMark 11 result too. Next up is the DirectX version of GFXBench. There are two game simulations, with Manhattan and T-Rex, and then some lower level tests to get a feeling for how the hardware performs on more specific tasks. 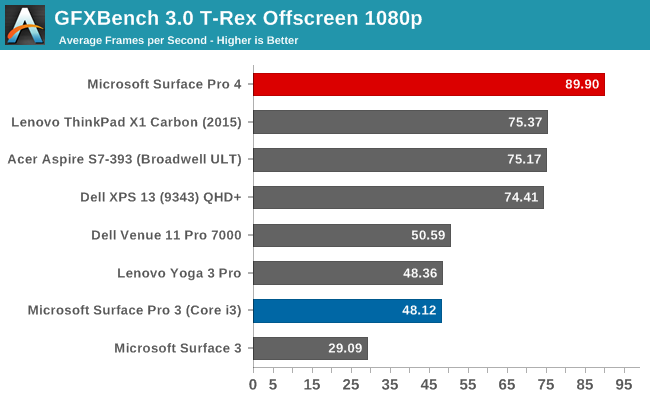 This was not run on the Surface Pro 3 so we can’t look at that comparison, but looking at the Dell XPS 13 scores will give us a comparison against Broadwell and the Yoga 2 Pro gives a comparison to Haswell. The jump in performance on Manhattan puts Skylake 20.3% higher than Broadwell and 54.8% higher than Haswell. Looking at T-Rex framerates, the increase over Broadwell is 22.2% and the jump over Haswell is 61.4%. A 20%+ gain over the last generation is great news. Intel has been behind on graphics for a while but they’ve put a lot of effort in on the last couple of generations. It would be fascinating to see what the GT3e GPU in the Core i7 model of Surface Pro 4 could achieve in the same 15 Watt envelope. Recently, Dota 2 was revamped by Valve to use a completely new engine under the hood. Dubbed Dota 2 Reborn, the Source 2 engine behind the game makes a number of changes and is a serious revamp of the old game. It is better able to utilize more CPU cores, 64-bit OS, and Direct3D 11. Because Valve has replaced the old version of Dota 2 wholesale - even removing the client - we have whipped up a new benchmark for us to leverage and I’ve taken the opportunity to test a couple of laptops with it. Since this is a new test though, it will take time to be able to fill out our bench with more results. 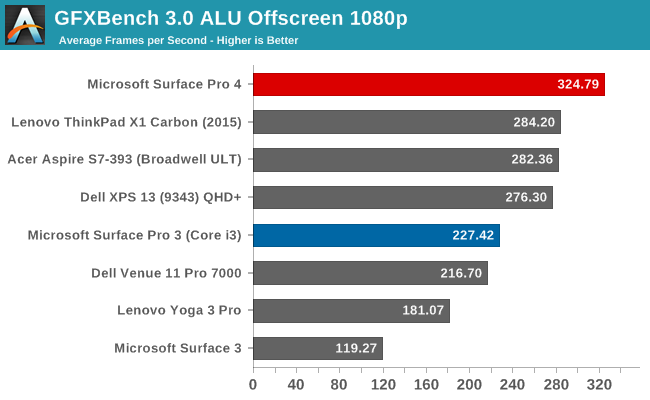 I’ve tested a Core i5-5200U laptop as well as Surface Pro 4 on this test. Much like the synthetic tests, once you get into a real world gaming test, the difference between Gen 8 graphics in Broadwell and Gen 9 in Skylake is actually pretty decent. And once again, as the complexity of the benchmark goes up, the increase in performance goes up as well. 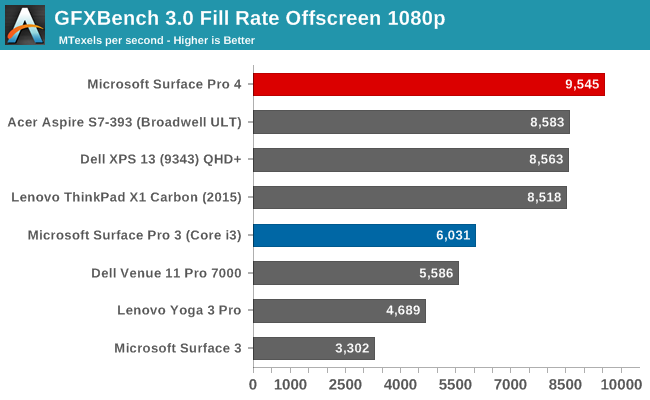 On our value settings, the increase was 14.6% but that increased all the way to a 31.8% better score on Surface Pro 4 on the Enthusiast settings. 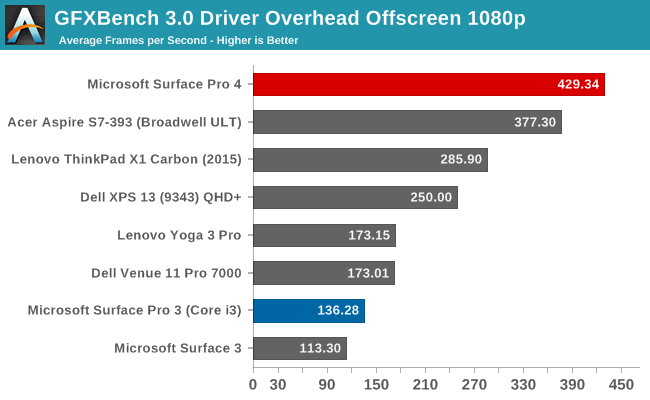 Looking at the overall picture then, the graphics performance in the Surface Pro 4 is clearly a healthy jump over Broadwell based notebooks, but it is an even more significant jump over Surface Pro 3. The move to Skylake has brought even larger gains to the GPU than it does to the rest of the system’s performance. 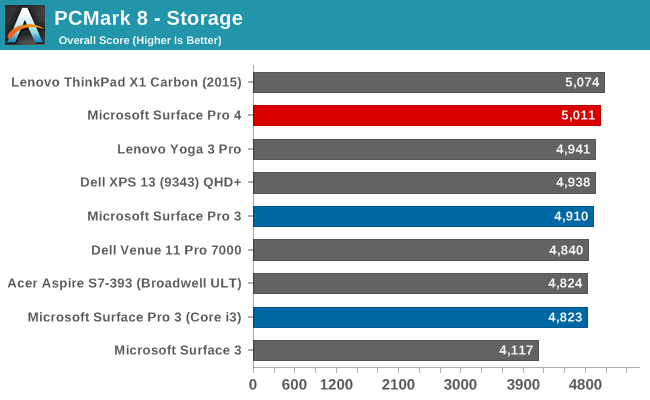 Surface Pro 3 offered storage options which started at 64 GB, and moved up to 512 GB. Surface Pro 4 ditches the smallest offering, and the base model now comes standard with 128 GB of flash memory. For those that need more, you can also get 256 GB, 512 GB, and also a new 1 TB model. This is more than just an upgrade to capacity too. 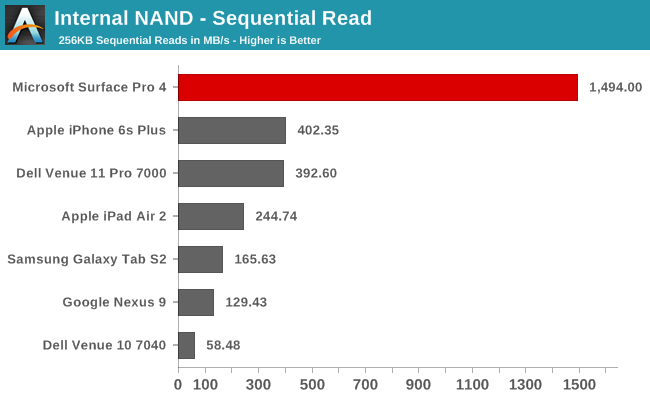 The flash storage is now PCIe 3.0 based NVMe which is a huge jump over the SATA based SSD in Surface Pro 3. First up, let’s take a look at PCMark 8’s Storage scores. See anything interesting here? Not really. The scores are very bunched together despite these being PCIe based drives. PCMark 8 tries to replicate real life workloads and as such the faster storage does not always come into play since you may not need it for very long. 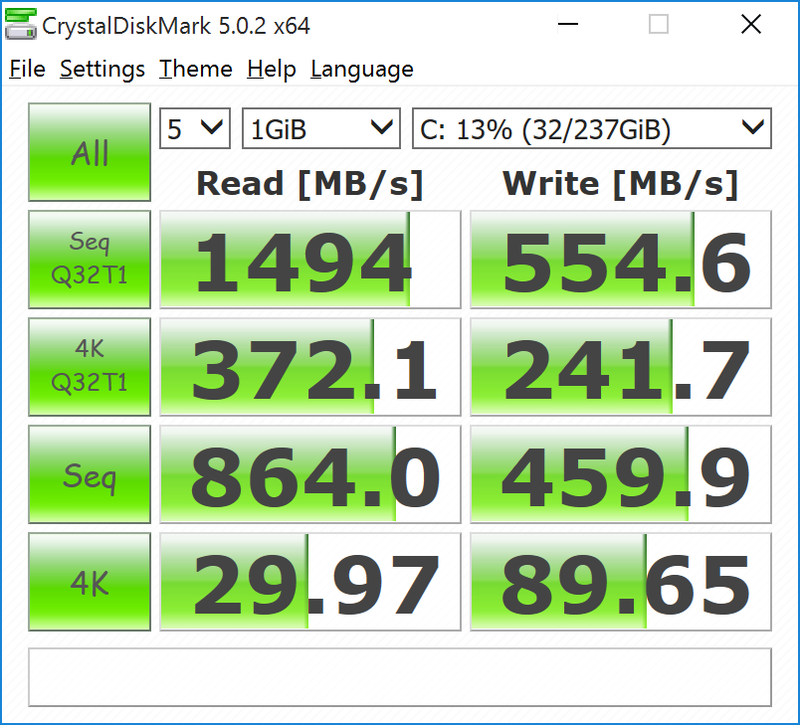 The difference in time between opening a file is going to be very small even compared to a regular SATA SSD. We’ve long since moved past the days of slow mechanical storage versus SSD comparisons so now we have a bunch of fast drives only getting faster. So with CrystalDiskMark we can see how the drive performs at more of its maximum speed. The results are pretty great. The write speed of 554MB/s is probably a victim of having fewer than the maximum number of NAND packages for the 256GB mode, but on the other hand read speeds of 1500 MB/s are pretty good. The random read and write is also very good. I’m really glad that Microsoft has gone all-in on storage here with PCIe and NVMe because these are premium products in their segment. If they would have stuck with SATA SSDs it would have been a knock against them. In real world usage, the ridiculous speeds are not seen all the time, but when you do tasks like copy a 6 GB movie file to a new folder, and it only takes a few seconds, you will appreciate the extra headroom that these drives offer. 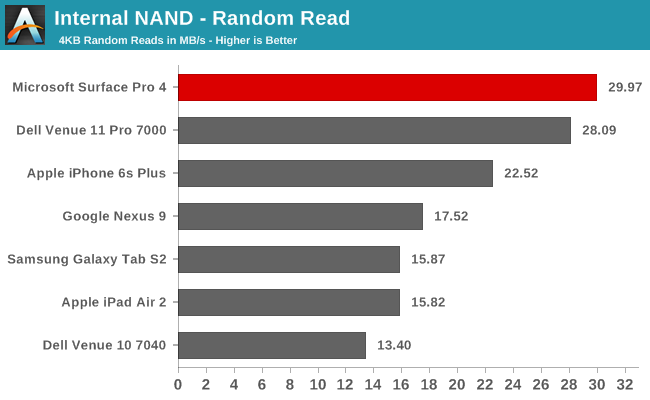 Since most tablets still rely on eMMC based storage solutions, they are no match for a PCIe based SSD. We will likely see more tablets and phones move this way soon though which should help cut the gap.